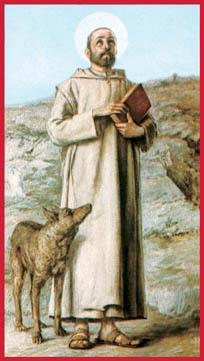 ST. WILLIAM, having lost his father and mother in his infancy, was brought up by his friends in great sentiments of piety; and at fifteen years of age, out of an earnest desire to lead a penitential life, he left Piedmont, his native country, made an austere pilgrimage to St. James's in Galicia, and afterward retired into the kingdom of Naples, where he chose for his abode a desert mountain, and lived in perpetual contemplation and the exercises of most rigorous penitential austerities. Finding himself discovered and his contemplation interrupted, he changed his habitation and settled in a place called Monte-Vergine, situated between Nola and Benevento, in the same kingdom; but his reputation followed him, and he was obliged by two neighboring priests to permit certain fervent persons to live with him and to imitate his ascetic practices. Thus, in 1119, was laid the foundation of the religious congregation called de Monte-Vergine. The Saint died on the 25th of June, 1142.